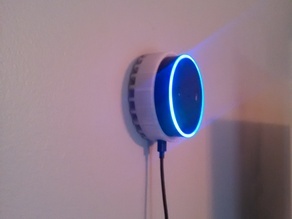 This is a really simple but functional design that I really like for my v2 Echo Dots. I made these on an ANET A8 printer using Tianse black 1.75mm PLA. The print took about 3 hours each. I typically do brims with everything but for these I would probably skip the brim because of the large flat bottom and it took a while to clean up the brims after printing.